If you are in search of a new family home in Derbyshire, the five bedroom detached Palermo is now open at our Ambience development in Linton. The generously-sized Palermo show home, designed over three floors, has two bedrooms on the first floor and three on the second and is ideal for growing families. There is an open-plan kitchen and dining room on the ground floor, with French doors opening out into the garden, flooding the space with plenty of natural light. This is also where you will find the cloakroom, snug and utility room. On the first floor, there is a living room that spans the front of the home, with three windows creating a light and airy atmosphere. A family bathroom and two bedrooms complete the floor. The master bedroom has a spacious ensuite and dressing area, and is situated on the second floor along with two further bedrooms. 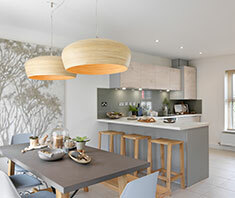 Calm and warm tones have been used in the kitchen to work alongside the large and bright French doors to create a feeling of light and space and inviting family feel, with statement lighting and textures to compliment the room. 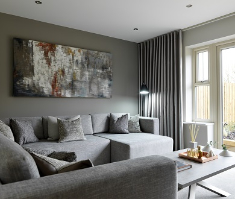 Tonal shades of cream and grey were used to compliment the statement 6 seated sofa which takes up the centre of the room, this family lounge is a spacious and bright room, with 3 large windows, this is the perfect place to relax and unwind. The master bedroom suite doesn’t shy away from rich textures, sumptuous fabrics and soft furnishings to add elegance and class. 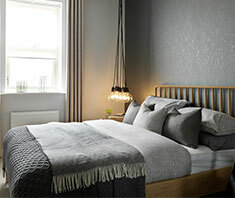 It really is the bedroom of dreams, with a spacious and luxurious walk in wardrobe area, how could you say no. 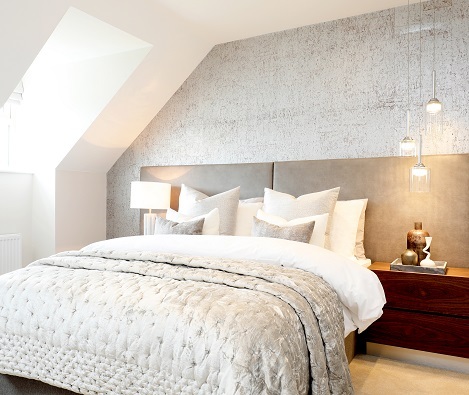 Striking patterns have been used throughout each room to accessorise and give the homes a modern and glamourous feel. A recent visit to Maison de Object in Paris was a fantastic source of inspiration for all the schemes at Ambience. Our interior designers have worked hard to make sure everything was carefully thought out to create that unique Strata feel throughout all our homes. While the Palermo show home might give you interior design inspiration, we also offer a range of customisation options to help make your home your own. Choose from a selection of worktops, units and handles in your kitchen, and take your pick from Porcelanosa tiles to create your individual style. Other optional extras are also available – your Customer Experience Manager will be able to explain these in more detail. The Palermo show home is now open from Thursday to Monday. Arrange your personal viewing with our Customer Experience Manager on 07507995918 or get in touch to find out more about our new homes in Linton.